Virginia wine is young, relatively speaking, and many of its early pioneers are, conveniently, still kicking. So when you have a burning need to know something, like, say, who in Virginia bottled the first single varietal petit verdot, a quick post on Facebook can tap into decades of knowledge. Even better than Virginia Wine Country's institutional memory, though, is the ever-present civility. No aggressive posturing, no shouting, no ego-stroking, just a group effort to share and remember. I’ve been struck by this for nearly a decade, since I got involved with Virginia wine myself. Several of my prior decades, spent mostly in the corporate world, were rife with very uncollegial in-fighting. This wine world, I’m always happy to rediscover, is not that world. 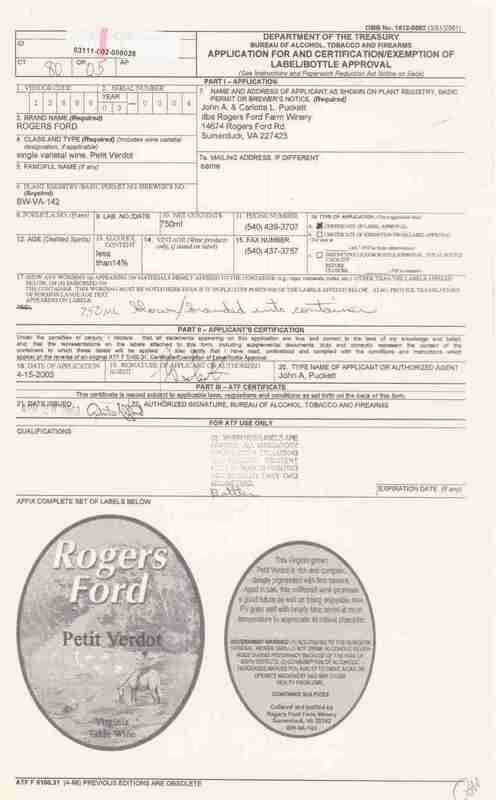 So, I posted the petit verdot query and after a couple days of watching comments roll in, I got a call from Johnny Puckett, current owner and son of the founders of Rogers Ford Winery in Fauquier County. “I figured since I made that claim about Rogers Ford possibly being the first, I’d better be able to back that up,” he laughed, and ran me through some research he’d done on the topic. He followed our call up with an email, in which he’s done a much better job of laying out Virginia’s history with petit verdot than I ever could. And in true Virginia wine community fashion, he’s done it graciously. 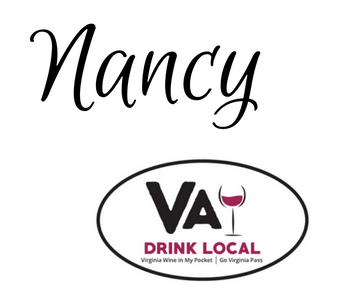 “Hey Nancy, I was talking with Chris Flemer [of Ingleside Vineyards] at a festival last weekend and I had an epiphany moment that I think will answer the burning PV question with real data. Before a new wine is bottled, all wineries must formally submit a label application to the TTB for federal approval and these label approvals are public record. It depends on what you consider the first Petit Verdot in Virginia to be. first date of issued approval? 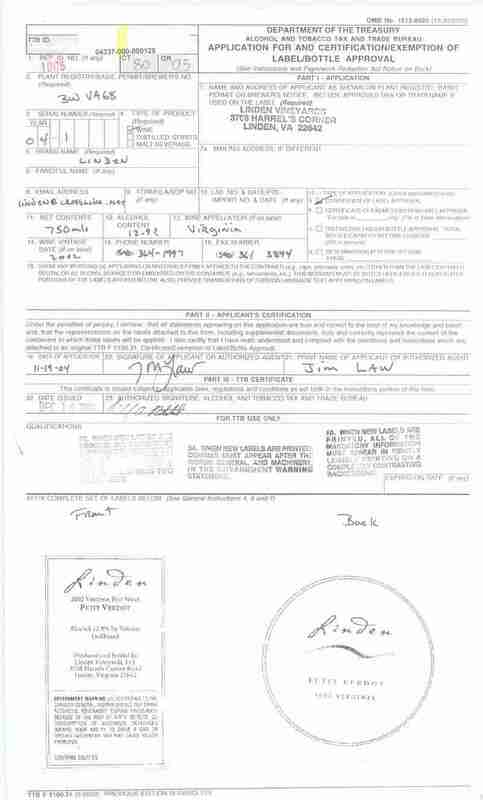 If you consider first date of application the winner is Jefferson Vineyards, whose date of application (below) is January 28, 2002 for a 2001 vintage PV. Strangely enough Jefferson's PV label was not approved until March 13, 2002. Which bring us to AmRhein Wine Cellars. 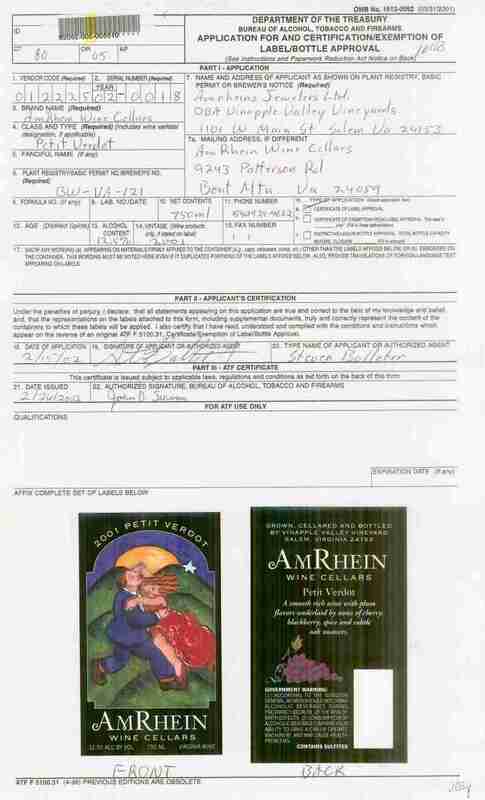 AmRhein Wine Cellars 2001PV date of application is February 15, 2002 also for a 2001 vintage PV. Here's the thing: This label was approved on February 26, 2002. This date is 15 days before the Jefferson approval. 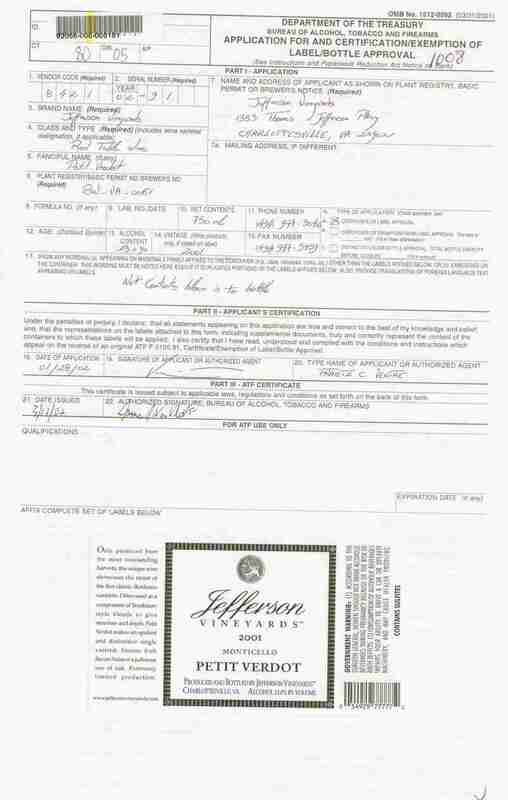 So, did the Jefferson application get filled out two months before it was actually filed with TTB? Did it get delayed in the mail? The AmRhein app was filed 18 days after Jefferson's but it was approved 15 days before. Making AmRhein the first PV label approved. 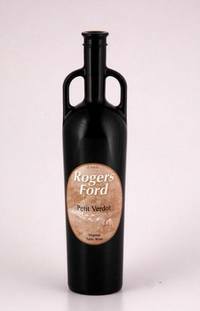 If you consider the first varietal Petit Verdot bottled in Virginia to be the oldest vintage date, it would be a 2000 PV cellared and bottled by Rogers Ford Farm Winery [NB: This wine was made with grapes grown at Horton Vineyards]. 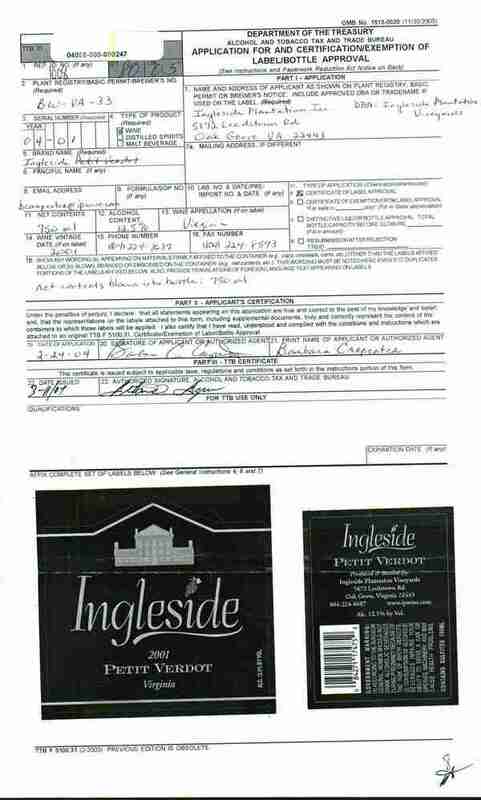 The label was approved April 28, 2003. The thing to keep in mind here is that this wine was an older vintage than the other PVs but spent more time in the cellar and was bottled a year after Jefferson and AmRein. Here's the thing: In the TTB record the vintage date for this wine is blank!? I only have photographs of a bottle of 2000 Petit Verdot. If I was a betting man, I would guess that this wine, though not the first Virginia PV, set the standard for this grape as a varietal wine, considering Ingleside’s resources and reputation, and the extra cellar time they gave this wine before release. I other words, an estate grown PV cellared for three years MAY have been the best wine. Just sayin'. This is the first varietal PV by Linden. Although not the first "stand-alone" varietal Petit Verdot in the group, Linden seems they had been producing red wine blends that were 80% PV for years. And legally these wines could have been labeled Petit Verdot if they chose to do so. I think this is a fun story and I think the takeaway here is that you had a few early adopters; creative and courageous people who noticed what was possible with this grape in Virginia. Wine is not a race to the starting line, that's not why we do this, but it sure makes a good origin story for PV in Virginia. Oh, and as for who was the first to plant PV in Virginia, that looks like a three-way tie between Tony Wolf at Virginia Tech, Linden Vineyards, and Horton Vineyards, all in 1991. And if we're missing somebody....just jump on in and let us know. For more on the beginnings of this wonder grape in Virginia, see Frank Morgan’s article, Petit Verdot Comes of Age.